Everyone – employees, customers, competitors, and candidates – is using social media; according to a study referenced in the book: “46 percent of the US population reports having accounts on three or more social networks”. Interacting in social media collectively within an organization creates ‘company culture’. A social media presence has become a pillar in personal and company branding. Social media is a platform that promotes and amplifies individual thinking. Think the acronym “OPEN: ordinary people extraordinary network”. Social is not change for change’s sake. It is a monumental shift in how we think, work, and live. 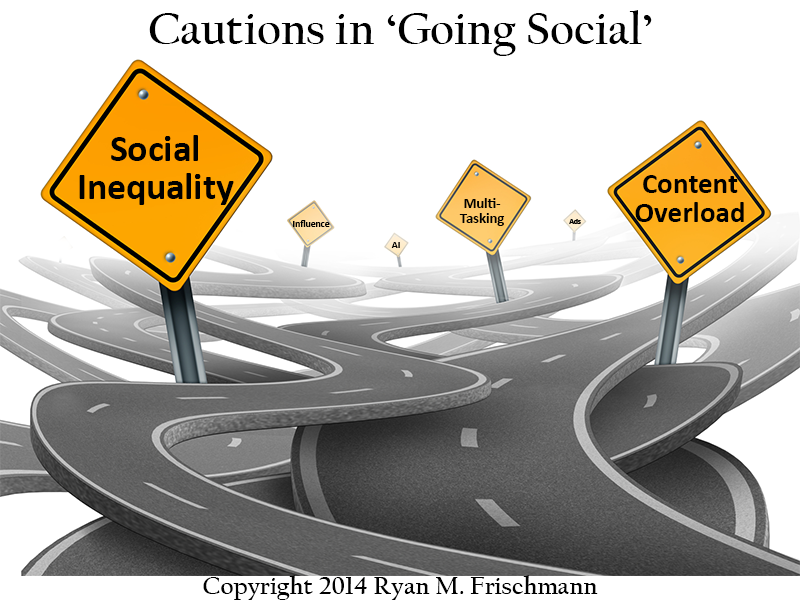 Participating in social may not cost much, but requires a significant commitment. The authors say there is not much of actual expense in running an organic social media campaign, which is true. However, it requires time, attention, and diligence. They say you may spend on average two hours a day in social media (often seven days a week). Moreover, it is not two hours you knock off in one sitting. It requires multiple bursts throughout the day, something they imply when they say you are expected to respond to requests within two hours. Embrace algorithms to make sense of massive flows of content. As everyone establishes their online presence and creates and curates content, we become inundated with the flow of knowledge. We cannot read all of the knowledge in our subject area created on a given day and, therefore, become increasingly dependent on a personal network and machine algorithms to feed us relevant content. Frequently they use the phrase “More Social. Less Media”. Perhaps they are trying to say that a back-and-forth personal interaction is priceless . I agree. Exciting to jump on the social bandwagon but the road will have bumps. Everyone wants to become an expert in a discipline, where they get recognized for their work and have interactions with an audience. Not everyone captures the attention of an audience. For example, 71 percent of tweets are ignored[ii] and a small minority of users – around .05% of the site’s population – are generating half of all Twitter posts[iii]. (Granted these articles were published in 2011, perhaps these stats have improved.) Not everyone can be an expert. The average income of a LinkedIn user is a $109,000 and over 60 percent of LinkedIn users make over $66,000 – making connections is a lot about the high income earners you know. To be egalitarian, social must: be accessible to all, have communities, and allow status movement. I think Coine’s and Babbitt’s social revolution is spot on. My only concern is the vastness of it all: billions of people and millions of companies vying for influence and content creation and dissemination at a magnitude we have never experienced before. A common perspective with personal branding is to create a personal marketing plan that mimics how a company brands a product. This is a good start, but tilts to an upper echelon of professionals (at least in my opinion). There are too many professionals. (This is why I suggest a functional perspective to personal branding.) Similarly, I fear social media might become a ‘popularity contest’ where influence is decided by the number of connections in your network and how many impressions you get on your posts. Hopefully, the authors’ notion of building communities based on an OPEN framework is adaptable to the massive growth in online communications we are and will continue to experience in the Social Age. I recommend picking up a copy of their book, they provide plenty of examples and stats to buttress their thesis. Next Next post: Why Create Content?